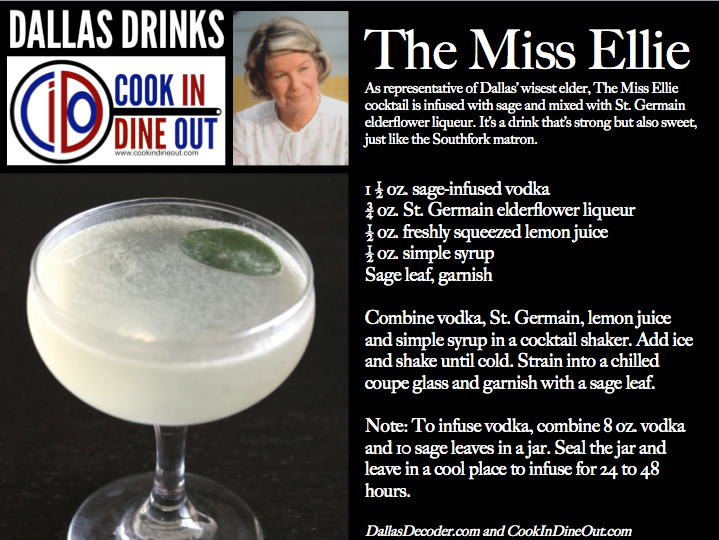 Dallas Drinks is a co-creation with Dallas Decoder, honoring the characters of the television show Dallas--both the classic series and the newer TNT Dallas, which continues the Ewing family saga. See all of the Dallas Drinks here. Dallas characters have a knack for getting in trouble. And who do they often turn to for help getting out of it? Miss Ellie, the wise matron of Southfork ranch, who more often than not know exactly what needs to be done. Thus, the vodka in the Miss Ellie cocktail is infused with sage and sweetened with the citrusy-fresh taste of St. Germain elderflower liqueur. Combine vodka, St. Germain, lemon juice and simple syrup in a cocktail shaker. Add ice and shake until cold. Strain into a chilled coupe glass and garnish with a small sage leaf. Note: To infuse the vodka, combine 8 oz. vodka and 10 sage leaves in a jar. Seal the jar and leave in a cool place to infuse for at least 24 hours (longer will make the vodka more flavorful, but be careful not to go too long).